Just one of the things that has taken up some of our time lately was a trip to the fair. We were going to go the first Friday, but Justin ended up working at the school instead. We did get to go this past Friday, though. It was a good deal since someone in front of us in line gave us an extra ticket. There were lots of animals and way too many games. 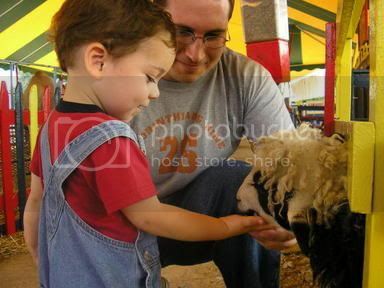 Jonathan liked to see all of the animals, but he especially liked the petting zoo. He couldn't get as close as last year, and the hand-washing police were everywhere. Some of his favorites other than the petting zoo were the rabbits, the ponies, and the elephant. Jonathan also made the News & Observer fair blog. You can check it out here: http://blogs.newsobserver.com/fair/. You just have to scroll down to Friday and keep looking. I always new he was a star. He's always Nana's little hunk! Love the website. It keeps me in touch with my family.